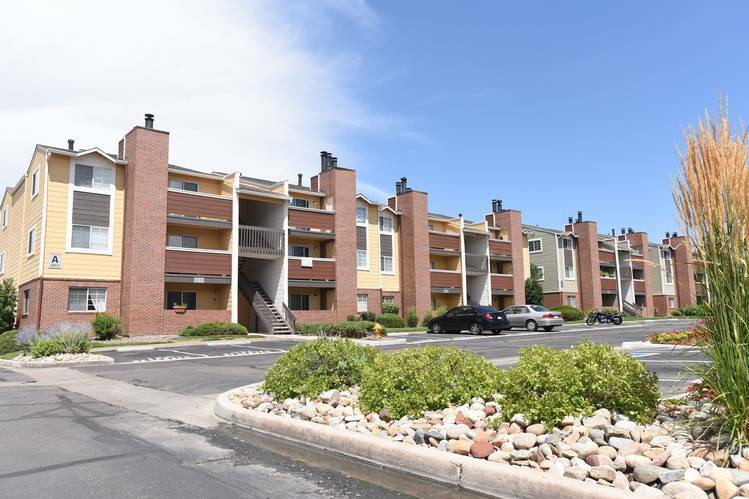 The Verona apartment complex in suburban Denver doesn’t have the flashy amenities some tenants covet. No infinity pool. No rooftop lounge. No concierge service. Still, demand at the 1980s-era complex is so strong that the landlord has raised the rent 72% on some apartments in just two years, after renovations. Modest apartment buildings like the Verona that cater to middle-class and working-class families are becoming scarcer as fewer are built nationwide and older ones are demolished. That has resulted in a severe shortage of midtier apartments, causing rents for these units to rise at a faster pace than for luxury ones. Even though construction of multifamily rental properties is running at the highest level in decades, the overwhelming majority of new units—more than 80% in the nation’s largest metropolitan areas—are luxury, according to CoStar Group Inc.
Construction costs are generally too high to justify building new complexes for low- and middle-income tenants, experts say, contributing to the scarcity. For instance, AvalonBay Communities Inc., one of the country’s largest apartment developers, spends $340,000 on average for each unit it builds, according to Dave Bragg, an analyst for Green Street Advisors. The average monthly rent, to make up for construction costs, is projected at $2,900—putting those units near the top end of even pricey apartment markets. The difference in costs between installing granite countertops and stainless-steel appliances is so slight compared to buying land and installing elevators that economists say developing a luxury apartment and a midtier one comes out roughly the same. Historically, developers could save some money by building low-rise buildings in suburban locations, but even those are becoming increasingly difficult to build as even suburban officials push developers to develop midrise buildings in central locations and reduce sprawl. New households are also much more likely to be renters than buyers, raising rents. Though rents are rising rapidly for all classes of apartments, the influx of luxury units is starting to slow rent hikes in that category, while the dearth of lower-priced apartments is having the opposite effect. According to Axiometrics Inc., an apartment research firm based in Dallas, rents during the second quarter of 2015 jumped 5.8% for Class B apartments, which are aimed at middle-class families. These tend to be low-rise suburban buildings from the 1980s, with amenities that often include an outdoor pool, a business center and ample green space. 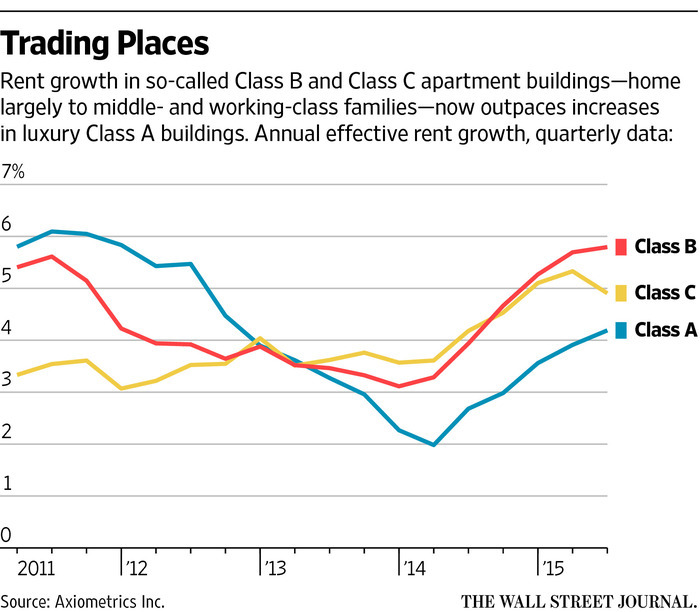 Rents rose 4.9% for Class C apartments, aimed at the working class. Meanwhile, rents grew 4.2% for Class A luxury apartments, which are more likely to be downtown high-rises with city views, infinity pools and doormen. “Everybody and their mother is out building these Class A apartments,” said Ryan Severino, senior economist at Reis Inc. “Nobody is building B and C apartments.” Research by Reis, which tracks commercial real estate, found that the supply of less expensive apartments, excluding rent-regulated units, has decreased 1.6% since 2002. Over that time, high-end apartment inventory has increased 31%. In many U.S. cities, fewer units are available to middle-income households, according to a report by New York University’s Furman Center and Capital One Financial Corp. In Miami, middle-income renters could afford 33% of recently available apartments in 2013, down from 40% in 2006. In Philadelphia, 35% were affordable to such renters, compared with 45% in 2006. Even though rents are rising faster on middle-class apartments, they are still considerably less expensive than luxury apartments. Rents for Class A apartments, which make up the top 20% of the market, averaged $1,702 in the second quarter, according to Axiometrics. Class B rents, which make up the middle 60%, averaged $1,192 and Class C rents averaged $845. In the Denver area, for example, rents average $1,686 a month for luxury apartments, $1,290 for midtier and $965 for lower-end, according to Axiometrics. In Boston, it is $3,345 for luxury, nearly $2,050 for midtier and $1,486 for the most affordable units. In the San Francisco area, Class A apartments are more than $4,000, Class B are $3,125 and Class C are more than $2,200. At the Verona in Littleton, Colo., applications from prospective tenants are piling up, prompting the management to work “faster, faster, faster,” to turn over vacant units, said Kevin Finkel, executive vice president at Philadelphia-based Resource Real Estate, which owns the complex and other midtier apartment buildings around the country. About half of the monthly rents turn into profit for the company, Mr. Finkel said. Resource Real Estate purchased the Verona in 2013, paying about $30 million for the 300-unit complex that includes 12 low-rise buildings. The apartments featured beige carpeting, dark brown cupboards and fake brick fireplaces. Resource poured between $3 million and $4 million into upgrades, including laminate countertops and faux wood floors. Rents are now pushing $1,500 a month for some two-bedroom units that had brought in $871 a month before Resource took over. Traffic from potential renters calling and touring the complex has risen 25% since Resource began renovations. To keep up, the company has renovation teams working double shifts to get units ready for new renters and it has also cut down on marketing. Mr. Finkel said the Verona appeals to millennials who can’t afford to buy a suburban house or rent a luxury apartment in Denver. Tenants are often single parents looking for an affordable place to live in a community with good schools. 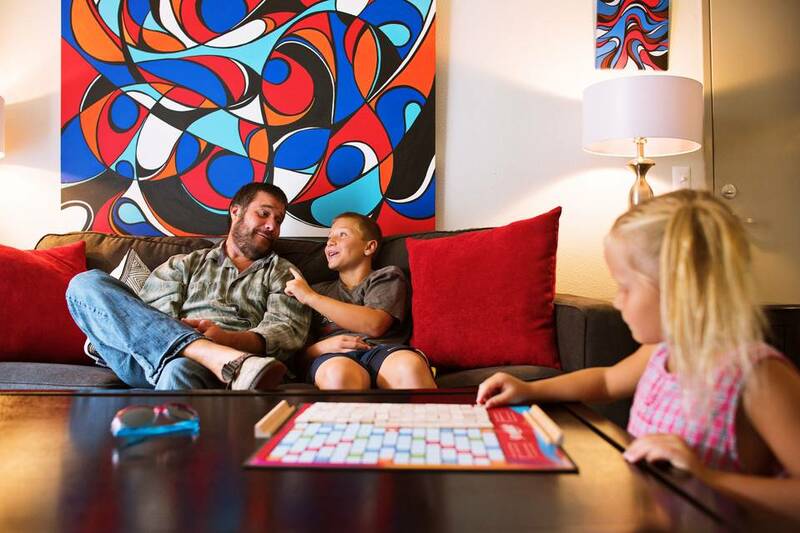 Ian Cochrane, a 39-year-old artist with two children, recently moved into the building after rent on the single-family home where he lived, in the suburb of Aurora, was set to rise to nearly $1,900 from $1,595. Mr. Cochrane, who was divorced in January, said the new apartment is more affordable at around $1,350 a month and has a saltwater pool and good schools for his daughter, 5, and son, 10. Denver, a historically affordable city for the middle class, has become less so as both rents and house prices have risen sharply. Overall, rents in the city were up 6% over the past year, according to Reis. Mr. Cochrane, who spent six years as a stay-at-home dad and relies on alimony payments to cover the rent, said the new apartment is affordable but he has little room to save. “It can be a struggle for sure,” he said. Nationwide, rent increases are inflating the pool of families classified as rent burdened, meaning they spend more than 30% of their income on housing. A report released last month by Harvard University’s Joint Center for Housing Studies found that one in five renter households with income of $45,000 to $75,000 a year was rent-burdened in 2013, up from about 18% in 2008 and 15% in 2003. Experts said that while some of the luxury apartments under construction today could eventually become more affordable due to oversupply, that isn’t likely to help middle-class renters soon. “The gap between what is the top of the market and what’s truly affordable has gotten so large that the odds of the new stuff ultimately becoming affordable is much smaller now than it has been in the past,” said Andrew Jakabovics, senior director of policy development and research for Enterprise Community Partners, an affordable-housing group.